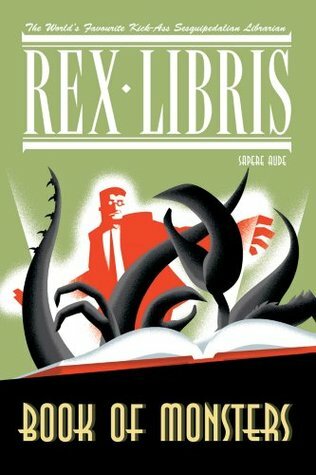 The astonishing story of the incomparable Rex Libris, Head Librarian at Middleton Public Library, and his unending struggle against the forces of ignorance and darkness. Rex travels to the farthest reaches of the galaxy in search of overdue books. Wearing his super thick bottle glasses, and armed with an arsenal of high technology weapons, he strikes fear into recalcitrant borrowers, and can take on virtually any foe from zombies to renegade literary characters. 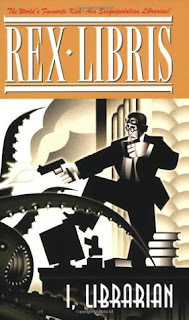 In this first collection of Librarian adventures, Rex must confront the powerful Space Warlord Vaglox and retrieve the overdue Principia Mathematica while an energy manifestation of blood thirsty Vandals attempt to burn down Middleton Library, and all within, to the ground. My only disappointment with this series is that it ended with no apparent plans for more issues. I loved this so much. It's hilarious and a blast to read, although, obviously, you're going to need to be able to suspend your disbelief big time. Rex Libris reminds me a bit of a noir detective version of Dr. Who with a very literary bent. I love how he's constantly fighting evil - but only because he needs those books to be returned on time. Seriously, it doesn't get any better for me than over the top, outlandish humor based on libraries and librarians. This series is ideal for librarians and those who love them and fans of Doctor Who and other cleverly done science fiction/fantasy type shows. It's not meant to be taken seriously and it's a blast to read. My one critique is that the format makes it super hard to read in print. The book itself is smaller in size than most paperback graphic novels and the text is just tiny in places. If eyesight is any issue at all, this one will be hard to read in print. Click here to see the webpage and get an idea of the comics.